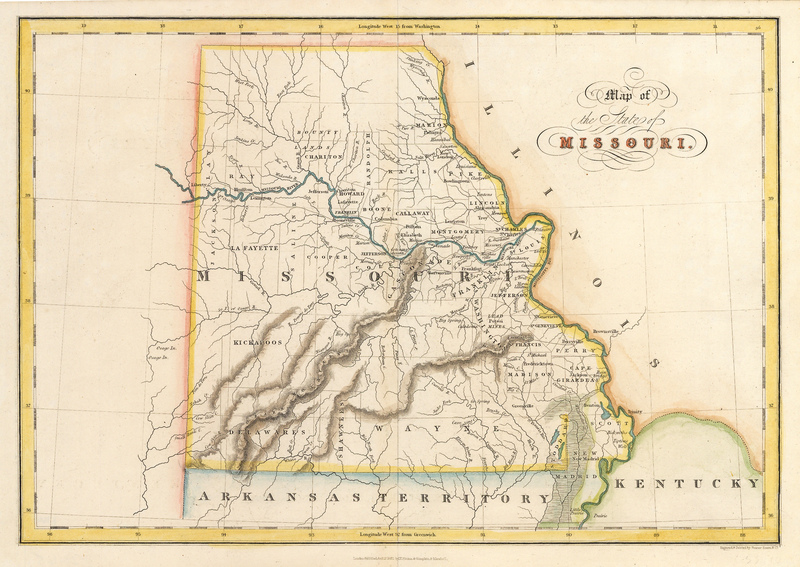 This is a scarce early map of the state of Missouri with all the state’s county borders and their names included. Missouri was part of the vast territory covered by the Louisiana Purchase, and gained statehood in August of 1821, becoming the 24th state. This is one of the earliest foreign-made maps of the state to have been published, appearing just eleven years following statehood. It shows primarily wide-open spaces with only a handful of cities or towns not situated on the banks of either the Mississippi or Missouri Rivers. Much of the territory was tribal land including Kickapoo, Shawnee and Delaware, with tracts of land set aside for veterans of the War of 1812 called Bounty Lands noted in the northern part of the state. Much attention is paid to river systems of the area. Condition: This steel plate engraved map is in A condition.